Liverpool were beginning their second campaign under Jurgen Klopp and after a promising start fans were expectant of a good start to set the tone for a strong campaign. The increased time Klopp has had to work with the players in addition to new signings and no European competition has served to heighten expectation at Anfield. Much of the first half was characterised by both teams’ struggles in their build-up phases. This led to a transition-focused game whereby the team on the ball was more vulnerable to conceding a chance due to the likely impending loss of possession. For the home side the major issue was a typically poor support from the midfielders in this phase of the game. When looking to start attacks Arsenal’s defenders often found themselves in far closer proximity to Liverpool’s forwards than their own team-mates. Arsenal’s midfielders often lacked either the positioning to find the spaces away from Liverpool’s press or the ability to receive the ball, maintain it under pressure and find routes to advance. The result was predictable, Arsenal were easily forced into a wing-oriented construction game. From here they were easily isolated and forced into long balls down the flanks or turning over possession more directly. On the occasions where the midfielders did move to escape the situational man-orientations of Liverpool’s midfielders the rest of the team did not react or adjust their positioning. This meant that they were still largely disconnected and despite the midfielders being on the ball retained no progressive means of advancing. If this was a plan to evade Liverpool’s strong midfield compactness it was a poorly executed one as once the ball went wide the midfielders lacked sufficient ball-orientation. This meant Arsenal’s full-backs were often left without viable passing options. The midfielders did not offer a route back into the centre or give the ball carrier time and space by attracting the attention of their opponents. There were one or two occasions where Arsenal moved forwards from the flanks with good passing combinations and generally stabilised their wide build-up through better connections. This was often due to the presence of Ramsey dropping from his attacking midfield spot towards these areas and offering an option to the ball carrier. These were too far and few between however and Arsenal’s build-up therefore lacked efficacy. 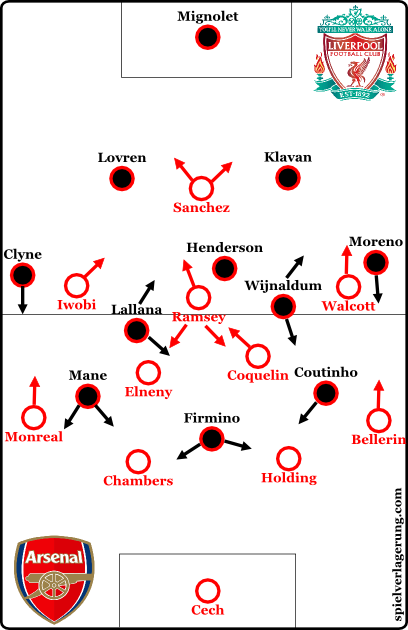 Credit must go to Liverpool who directed Arsenal’s build-up well with their strong positioning and pressing mechanisms. One of these was their high central control, in their narrow 4-3-3 defensive shape they had good access to the centre and half spaces and crucially retained the ability to press Arsenal’s midfielders both from the forward and midfield lines. By the nature of their positioning Liverpool could easily outnumber Arsenal’s midfielders in the centre of the pitch. Furthermore the lack of needle playing ability from the likes of Elneny and Coquelin meant these situations would be highly favourable for the away side. In conjunction with their strong positioning Liverpool’s forwards directed Arsenal’s build-up well with a strong usage of curved runs and cover shadows. Although they were mostly passive against Arsenal’s back line, on the occasions they did press they took up positions to prevent passes in central areas through their cover shadows. This could be seen when Firmino would start between Arsenal’s defenders and press the ball carrying centre back to prevent the switch to the other. Klopp’s side suffered from similar issues, namely the inability to progress their build-up via the midfielders. Against Arsenal’s man-oriented pressing Liverpool struggled to build-up effectively. These man-orientations were particularly active in midfield and were effective at forcing Liverpool to search for alternative routes of progression. Arsenal’s man-oriented pressing was generally quite stable, not because of any strong mechanisms but due to Liverpool’s inability to manipulate and bypass them. A static attack is strategically the best match for a man-oriented defence, given that it does not challenge the mobility of thedefenders and the speed at which they have to re-organise themselves to re-align against their opponents. It was no surprise therefore that Liverpool struggled to use their midfielders in build-up with their generally static nature making life easy for the likes of Ramsey, Coquelin and Elneny. There were one or two instances where Henderson rotated with one of the 8s leading to a quick and effective central build-up but this sort of rotation was far too rare. Although it may seem counter-intuitive, the pairing of man and ball-orientation on some level is quite common. Essentially it means that man-orientations are more active on the near side whilst the ball-far players shift across and attempt to maintain some level of compactness. 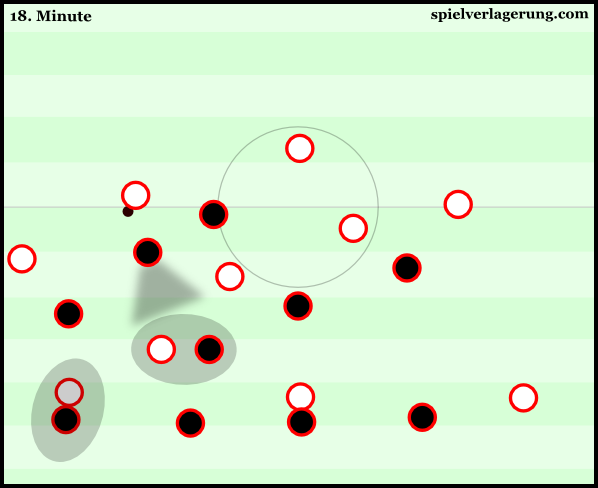 The ball-far players may still man-mark but it would generally be against a more central opponent, for example a right winger marking an opposing left central midfielder. With Arsenal’s man-orientations being more focused on the near side diagonal passing could have been another potential tool for Liverpool to bypass Arsenal’s pressing. There were a number of instances where Liverpool’s ball-far 8 was free to receive passes as Arsenal’s ball-far winger took their time to shift across. However liverpool’s defenders were either lacking the confidence or the vision to play those passes. Furthermore with Mignolet’s general incompetence in this phase of the game they lacked the ability to use him as an immediatefree man in these situations which could have been another method to disrupt their man-oriented opponents. 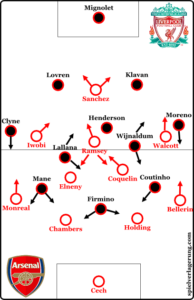 Generally Liverpool lacked the collective press resistance to build attacks consistently against Arsenal’s pressing. Theoretically they could also have made better use of Lallana’s individual press resistance with his agility, close control and ability to use both feet he can be quite difficult to press. He certainly possesses the required qualities to be of greater assistance in this phase than he was. Overloads in specific areas of the pitch are an increasingly common offensive tool. They can enhance the ability for forwards to combine quickly and can assist with significantly altering the defensive shape of an opponent. However several overloads are made redundant by the offensive team themselves due to a lack of sufficient organisation within the area. Arsenal, with their free form offensive nature. are a prime example of this. With the players being given no guidelines for a structured attack Arsenal players can be seen acting wholly out of their own will in offensive situations. While this can at times create great combinations, the lack of structure often harms the ability for their players to use their talents. It is also no surprise therefore that their attacks are inconsistent and reliant on moments, not only from game to game but from minute to minute. The above image is an example of one of their typical redundant overloads. Elneny has the ball in this situation and technically Arsenal should benefit from a 5v4 advantage in the immediate vicinity. However the presence of Bellerin in front of him effectively does half of the defending for Liverpool as it removes three passing options effectively rendering those players redundant and practically changing the situation into a 2v4 underload. This lack of offensive organisation crippled Arsenal’s attack not only for much of this game but for the best part of the last few years. In the exchanges immediately after the interval Liverpool took control of the game, with a number of mechanisms they gained and began to dominate territory as they had done towards the end of the first half. One of these mechanisms was simply to engage their opponents higher up and press earlier in Arsenal’s build-up and force long balls or regain possession quicker. When they did have possession Liverpool were a bit more patient with their circulation allowing them to spend more time in higher zones but crucially they maintained the high ball-orientation the forwards displayed in the first half. This gave Liverpool the potential for quick combinations to increase the pace of attack in the final 3rd. Furthermore it assisted their ability to prevent counters, with Arsenal finding space much harder to come by with Liverpool occupying the areas around the ball. When Liverpool had the ball in higher areas it was not difficult to maintain it due to the passivity of Arsenal’s defence. With Arsenal lacking sufficient intensity against the ball they were vulnerable to the sort of lengthy passing sequences that Liverpool put together on a number of occasions. With more time being spent in attack and the likes of Firmino, Coutinho, Lallana, and the outstanding Mane given a platform to combine Liverpool were always going to be dangerous. Furthermore the support from the likes of Wijnaldum and Lallana enhanced the use of 3rd man runs to create scoring opportunities. The video above demonstrates the dangerous combinations and passing sequences Liverpool put together that saw them take a 3-1 lead before Mane’s excellent goal. Through a combination of Arsenal’s increased desperation and Liverpool’s caution, Arsenal dominated possession for the minutes immediately after as Liverpool sought to close out the game.They fell back into a 4-1-4-1 mid-block earlier than previously and were again somewhat passive against Arsenal’s first line. With decent covering from Liverpool’s midfield line and a lack of presence from Arsenal, Wenger’s men found access to the centre difficult to come by. Their attacks therefore consisted largely of direct balls to the flanks and crosses from weak positions. Towards the end it became a lot more balanced and Liverpool even began to saw more of the ball by maintaining the ball in higher areas. Whilst they could press Liverpool rather effectively in the opponents’ half, Arsenal lacked a cohesive pressing structure in their own half. Despite being a goal behind Arsenal were still fairly passive when defending in their own half, on the occasions they did attempt to press the efforts were rather individual and improvised and thus easy to play around. Liverpool used this weakness to maintain possession in higher areas and wind down the clock. After a largely disjointed first half from both sides Liverpool dominated the game for the 20 minutes after half time and last 10 minutes of the game. This was enough for them to gain a commanding lead and then close it out. In the spell after half time they demonstrated their high offensive potential and their progress in Klopp’s second season will be keenly followed as the Liverpool faithful dream of the title. Arsenal however showed several of the same weaknesses that have plagued their game for the best part of the last few years. It is of course only the first game of the season and it is important to note the significant absentees in Koscielny, Giroud and Mertesacker whilst Cazorla came off the bench. However it is the underlying strategic frailties that Arsenal fans should be most concerned about. It goes without saying that significant improvement will need to be shown if Arsenal are to maintain their perennial top 4 spot. Mignolet is actually quite good with the ball at his, certainly better than the likes of Cech, Courtois etc. He just needs to be encouraged to play out from the back. Since Klopp’s arrival, this hasn’t been the case very often. But when he was asked to do so, he did it very well. Just watch the first leg vs Villarreal. I’ve loved the article, fantastic work! I was reading it, and in the graphic of the Liverpool midfield isolating Arsenal midfield, i was wondering, in your opinian, in that case how many players should Arsenal put behind the Liverpool 1st line of pressure? Or if it was against a 4-4-2? I always though that one is enough but maybe in your opinion isnt? I would never be absolute in prescribing a certain number of players that need to be in a certain area. In this case it was partly an issue of the player profiles that were in that position. It was a high pressure zone and neither Coquelin or Elneny excel in that kind of environment. Santi Cazorla would be perfect to receive under that sort of pressure as long as he had decent structuring around him and at times even if he doesn’t. But in a system like Arsenal had, with 2 midfielders, Arsenal had plenty of numerous(not equal to quality) to progress, even if they just tried to put a vertical pass between the lines. The only down thing that i saw in the system(not in the actual spatial occupation, etc etc) was that Walcott and Iwobi were very wide and sometimes in the same line of the fullbacks. The problem was not the positioning of arsenals pivots but their lack of skill in receiving passes under extremely high pressure. Elneny and Coquelin both excel at the defensive and running duties but lack the technical skill of Cazorla or Wilshere. Adding to this Problem was the lack of playmaking abilities further up the pitch. Iwobi and Walcott are wide forwards, Ramsey doesn’t like the tight spaces so much either and Sanchez as the lone striker could not fall back that deep. Excellent article again JD! I’m a Chelsea fan and I’m wondering what I can expect from Conte in terms of positional play! I watched the West Ham game disappointed with the lack of support to the ball carrier and the lack of central focus. Perhaps that shall feature more as the season goes on I hope. What do you think? Also, I’m trying to run a blog of my own and was just wondering what you use to create your tactics board pictures of the pitch (for example, the picture used for the redundant overloads). Yeah I expect Chelsea to show different types of possession games perhaps depending on their opponents. One is the very structured build-up with one or two different schemes like we saw with his Italy side at the Euros, another is a more free form and perhaps less effective one. In terms of a lack of central focus this seems to be a feature with Conte as he seems to prefer to use his midfielders to open direct routes from defence to attack. Also Inkscape is the programme we use to create our graphics. Thank you very much JD! Hopefully we can sign Koulibaly and get some verticality! I was however impressed with how Conte used the full-backs to force West Ham into a situational back six. Hopefully as the season progresses, Chelsea will get better at penetration – he had implemented the famous “Rondo” game with push-ups as punishment for losing the ball!